William Mouncey (1852-1901). Mouncey was born in Kirkcudbright and worked as a house painter and decorator before becoming a full-time landscape artist. He spent most of his life at Kirkcudbright, much influenced by his friend, E.A. Hornel, whose sister he married. Devoted to his native countryside, he represented it in warm and mellow colours and used the impasto technique to apply the paint. 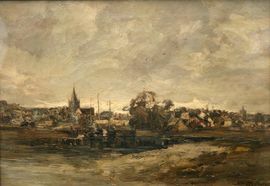 Mouncey exhibited at the Royal Scottish Academy and at The Glasgow Institute and benefited from the patronage of dealers James Connell & Sons, Glasgow.